FOOTBALL: PRESSURE is mounting on Woking’s board of directors to make wide-scale changes, both on and off the pitch, writes Andy Fitzsimons. 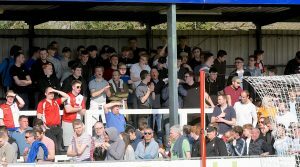 It comes after a minority, but nonetheless hard-core group of Cards supporters chanted “sack the board”, both during and after the club’s 2-0 home defeat against Bromley last Saturday. For the full story and more on The Cards, see the 19 April ’18 printed edition.